Get a FREE $7.50 Voucher to spend on Your Baby. Plus We'll enclose a Baby Expert Report, Giving You Everything you need to know about Washable and Disposable Diapers. With Every FREE Beaming Baby Pack! Why You Must Order This FREE Pack Plus Bonuses Right Now! Congratulations! It's great news that you have found this page! Now Please act swiftly - there's no time to lose! By choosing Beaming Baby Bio-Degradable Diapers, YOU have taken a big step towards giving YOUR BABY The HEALTHIEST Start to Life! Most babies suffer from Diaper Rash, Eczema, Asthma or Sensitive Skin Problems in their first three years of life. Many of these problems can be EASILY solved by avoiding Harsh Chemicals. Beaming Baby's Bio-Degradable Diapers contain 54% LESS Chemicals than standard diapers (and 38% less than other eco-diapers). By using Beaming Baby's Bio-Degradable Diapers, you have shown that you are in the TOP 5% of Moms and Dads who will go the EXTRA MILE to protect your baby from the harsh chemicals in standard baby products. Not only will you be DRAMATICALLY reducing the number of chemicals which YOUR BABY comes into contact with on a daily basis, but also, you can rest assured that you are using the Most Environmentally Friendly Baby Essentials on the Planet! HOW ARE BEAMING BABY DIAPERS HEALTHIER FOR MY BABY? Your Baby will probably wear a Diaper most of the day and night for the first Three Years of their Life, with only a few breaks for bathing, changing and the occasional 'free range' moment! There is Strong Evidence from Dermatologists in the UK and USA that the Chemicals in Standard Diapers 'contribute to thousands of cases of Baby Diaper Rash every year'. This is validated by over 140,000 Beaming Baby Customers, many of whom have reported Diaper Rash literally disappearing when they switch to Beaming Baby Diapers for their Baby. Not only have we RADICALLY reduced the chemicals in these diapers, and removed any Harsh Chemicals altogether, but we have also introduced a REVOLUTIONARY Naturally Breathable Layer against Your Baby's Skin. Combined with a TOTALLY GM FREE Absorbent Core to keep the wetness away from your baby's bottom for up to 12 hours. The soft inner layer will gently PROTECT and SOOTHE sensitive bottoms. Giving your baby the perfect solution for NATURALLY HEALTHY skin. These are The World's Most Advanced, Environmentally Friendly Disposable Diapers with Premium Performance, designed for Superior Comfort during an active day and to last for up to 12 hours to encourage a Good Night's Sleep! They use 54% Less Chemicals than Standard Disposable Diapers and are Kind to All Babies; especially for those with Eczema or Sensitive Skin. They form a Naturally Breathable Layer against Your Baby's skin; the top sheet is made with Natural Cotton and Cornstarch Fibres. HOW WILL MY BABY BE HAPPIER With Beaming Baby Diapers? Your Beautiful Baby will want to WRIGGLE, move and SNOOZE with ease and COMFORT so we have developed SOFT Stretchy Panels on both sides and at the back to accommodate every position for both day and night. And of course, being a Healthier Little One, due to less chemical exposure, Your Baby is certain to be HAPPIER too! YOUR HAPPINESS GUARANTEED with Beaming Baby Diapers! We GUARANTEE that YOUR BABY will be HEALTHIER and HAPPIER with Beaming Baby Essentials than any other baby brand. Even Better than that, we Guarantee that after 7 days with Beaming Baby Diapers, Your Baby will not suffer from Diaper Rash, or we'll give you Your Money Back! If you and your baby are not TOTALLY HAPPY with any Beaming Baby Product, just call or email us for an immediate, no quibble credit or refund. We'll even collect any unopened products entirely Free of Charge! Have you tried our Certified Organic Baby Wipes? Have you tried our Bio-Degradable Diaper Sacks? Have you tried our Bio Degradable Diapers? WHAT ABOUT OUR WONDERFUL PLANET? How do Beaming Baby Diapers Care for Planet Earth? OVER 77% BIO-DEGRADABLE, (including the packaging) that's 53% more bio-degradable than standard disposable diapers and 33% more bio-degradable than eco-disposable diapers; this is the Most Bio-Degradable Disposable Diaper in the US. Most of the diaper Bio-Degrades within 4 Years instead of the MIND BLOWING 400 Years that standard diapers take! Making the World a Cleaner and Better Place for Your Baby to grow up! Our factory is currently building a WIND FARM, to help us achieve our goal to be CARBON NEUTRAL and Reduce Global Warming for our children. They have a Bio-Degradable water resistant outer sheet made with Natural Cotton and Cornstarch Paper. The GM Free Absorbent Layer is fortified with 100% Natural Cornstarch. The packaging is Bio-Degradable to further reduce the impact on the environment. Tie me up and dispose of me hygienically please I'm Bio-Degradable, but please don't flush me in case I block your bathroom! 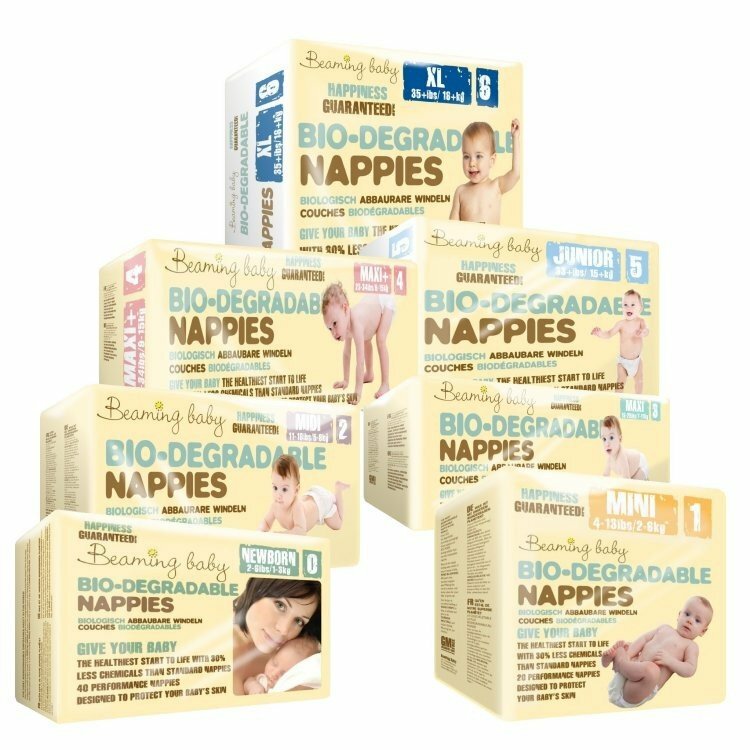 Beaming Baby Bio-Degradable diapers are Totally Chlorine Free and contain only Clean Plastics which are used in the Velcro patch and elasticated back and side panels. How are Beaming Baby Bio-Degradable Disposable Diapers made? The Most Important Layer of the Diaper is the Revolutionary Naturally Breathable Inner Sheet of the Diaper which lies against Your Baby's soft, sensitive skin. This sheet is made with Natural Cotton and GM Free Cornstarch fibers woven into a soft fabric sheet. The Absorbent Layer inside the Beaming Baby eco-disposable Diaper is made primarily from "fluff", this is very finely shredded paper, which has the consistency of cotton wool. Intermingled with the "fluff" are tiny balls of 'gel'. In Beaming Baby Bio-Degradable Diapers, we use a mixture of Bio-Degradable Gel, made from GM Free Cornstarch and standard Gel - this is very similar to the silica gel you may see in a camera case - designed to keep the camera dry. The Breathable Back Sheet is also made from a Soft Weave Cotton and Cornstarch material designed to allow air through one way, but keep the moisture inside to ensure Your Baby's Clothes Stay Dry. The Velcro-style fasteners are made from polypropylene; a 'Clean Plastic', these are designed to be strong enough for re-fastening and soft and smooth if they come into contact with Your Baby's Sensitive Skin. Our Eco-Diapers are designed to fit perfectly, with STRETCHY PANELS on both sides and at the back, as well around the legs. This is not only far more comfortable for Your Baby, but it also helps to AVOID THOSE INFURIATING LEAKS that wet baby's clothes. Beaming Baby's environmentally friendly Diapers are designed to Give Your Baby Extra Comfort during an active day and to Help Baby Sleep through the night. Vegan Society Approved, No animal products used in these Diapers. Find out Why Organic Baby Wipes are the best for Your Baby's Health and Happiness!